Sometimes you want to play with family or friends, but you don’t want to get tired mentally. You rather want to relax, talk with someone etc. In such situations games with random element are fine. Some of these games are very popular like Pachisi or Ludo. Unfortunately, Ludo is quite simple … too simple. Perhaps you’d like to play some game similar to Ludo, but you want this game to be a bit more challenging, more surprising or demanding more strategic thinking? If you are looking for such game I propose Malefiz. Malefiz is a game for 2, 3 or 4 players, well known in Germany. It was designed by Werner Schöppner, a man who first worked in a bakery, and later become a system analyst. Schöppner was clearly inspired by the game Pachisi or maybe Ludo. But in his own game he resigned from “cross and circle games ” design and introduced a new type of neutral pieces – so-called barricades. The game, developed by Schöppner was published by Ravensburger Spieleverlag GmbH since 1960. The game was sold under many names in different countries. In Poland, it was known as “Barykada”. Other names in other languages include: Gold Rush, Hindernislauf, Hoppla, Obstruction or Ett tjuv- oh rackarspel. Trade names of this game were often the word “barricade” in different languages and so the game was known as Barricada, Barricata, Barrikad, Barrikade etc. To play Malefiz you need a board like this on the picture below. One field on the top of the board is specially marked (in this case by a star). Lower fields arranged in the shape of a cross (with color highlighted lines) are also important. There are other versions of the board, where the lower fields are arranged in the C-shape or a pentagon shape. This can be seen in the booklet with rules provided the Ravensburger company. Malefiz boards are sometimes wooden, with holes instead of the fields. It looks lovely. Apart from a board you need pieces and dice to play. 11 white pieces (so called barricades). The game is designed for 2, 3 or 4 players. Playing against 3 opponents is certainly most funny. In such a situation, there are simultaneously 31 pieces on the board (20 players’ pieces and 11 barricades pieces). Initial setting is shown on the diagram below. White barricades are always placed on the same fields at the start. 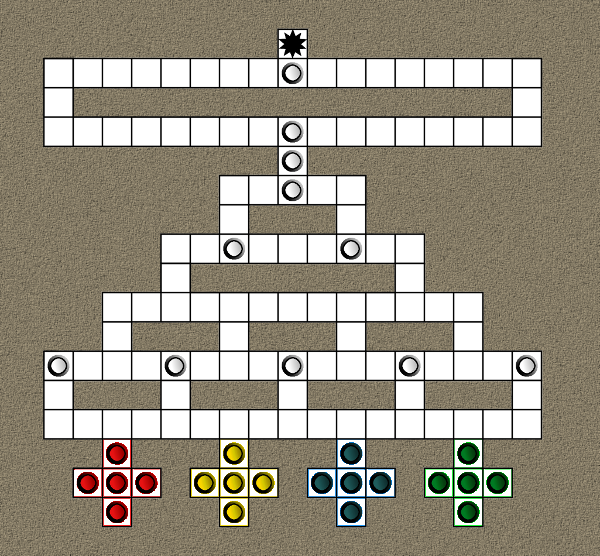 Players’ pieces are placed on the lower fields arranged in a cross shape. Each player (yellow, green, blue and red) has its own starting positions. You also need one die to play. You can play with two dice, but the basic variant requires one. Malefiz is a race game. Players race to final top field marked with the star. The winner is the first player who get one of his pieces on this field. Of course, there are some important rules in this race. Players make moves sequentially. In one turn player rolls a die and moves one of his pieces in any direction, for as many fields as shown on the die. The diagram below shows the move possibilities after throwing 4. The player has three possible ways (large red dots indicate final reached). If there is another player’s piece on the way, it can be simply bypassed (or it can be captured – see below). Note: It is not allowed to move forwards and backwards in one move. You can turn, but you can’t move forward and then backwards. Note II: In the first move, central field of starting fields counts as a first field. If there is barricade on the way chose by a player, this barricade can not be passed. It must be removed first. Removing a barricade occurs when a player lands one of his pieces on the top of barricade (with an exact throw). The player who removes a barricade, have the right to place it on any chosen field on the board, with the exception of the fields in the lowest (first) row. If a player standing before barricade throws a number of points not allowing to remove it, he or she may approach to the barricade. He can also move back. If player lands on the field occupied by opponent’s piece, this opponent’s piece is captured. Captured piece is sent back to the start and begins its journey from there. Some people like to play Malefiz with two dice. In this case after each turn player moves not one, but two of its pieces. The game becomes more dynamic and the player has more capabilities of moving. This game is very funny, especially if four people are playing. It is relaxing, but at the same time quite complex tactics makes it interesting. During the game you have to take care of having a lot of pieces in play. The more pieces in race means the greater chance of removing barricades. And removed barricades can be used block opponent or to protect your pieces. I would recommend this game to anyone looking for funny game for meeting with friends with a beer, coffee or other beverages ;-). You can buy Malefiz sets on Amazon. By buying you support creator of this blog.